SEOUL, SOUTH KOREA (AP, SEPTEMBER 22, 2017) — North Korean leader Kim Jong Un, in an extraordinary and direct rebuke, called President Donald Trump "deranged" and said he will "pay dearly" for his threats, a possible indication of more powerful weapons tests on the horizon. 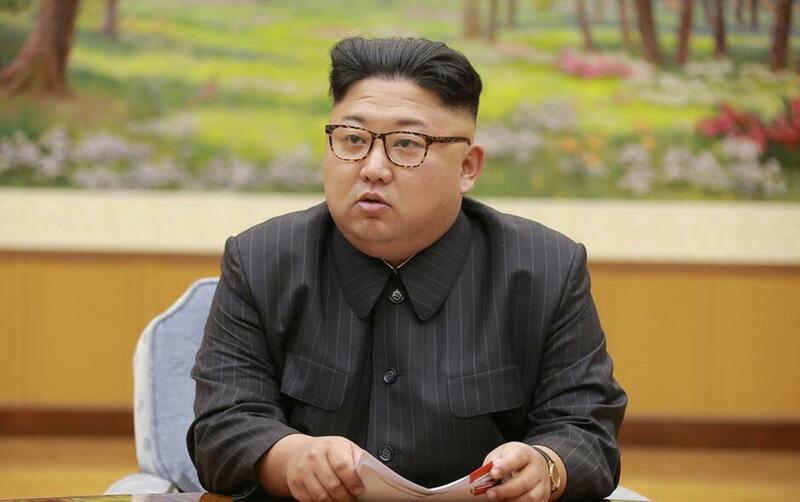 Hours later, North Korea's foreign minister reportedly said that his country may be planning to test a hydrogen bomb in the Pacific Ocean to fulfill Kim's vow to take the "highest-level" action against the United States. Kim, in his statement, said Trump is "unfit to hold the prerogative of supreme command of a country." He also described the U.S. president as "a rogue and a gangster fond of playing with fire." The dispatch was unusual in that it was written in the first person, albeit filtered through the North's state media, which are part of propaganda efforts meant to glorify Kim. South Korea's government said it was the first such direct address to the world by any North Korean leader. Some analysts saw a clear sign that North Korea would ramp up its already brisk pace of weapons testing, which has included missiles meant to target U.S. forces throughout Asia and the U.S. mainland. "I will make the man holding the prerogative of the supreme command in the U.S. pay dearly for his speech calling for totally destroying the DPRK," said the statement carried by North's official Korean Central News Agency on Friday morning. DPRK is the abbreviation of the country's official name, the Democratic People's Republic of Korea. North Korean Foreign Minister Ri Yong Ho told reporters on the sidelines of a United Nations gathering that his country's response "could be the most powerful detonation of an H-bomb in the Pacific," according to South Korea's Yonhap news agency. Ri reportedly added that "We have no idea about what actions could be taken as it will be ordered by leader Kim Jong Un." Such a test would be considered a major provocation by Washington and its allies. The statement by Kim Jong Un responded to Trump's combative speech at the U.N. General Assembly on Tuesday where he mocked Kim as a "Rocket Man" on a "suicide mission," and said that if "forced to defend itself or its allies, we will have no choice but to totally destroy North Korea." Kim characterized Trump's speech to the world body as "unprecedented rude nonsense." He said Trump's remarks "have convinced me, rather than frightening or stopping me, that the path I chose is correct and that it is the one I have to follow to the last." Kim said he is "thinking hard" about his response and that he would "tame the mentally deranged U. S. dotard with fire." Kim Dong-yub, a former South Korean military official who is now an analyst at Seoul's Institute for Far Eastern Studies, said Kim Jong Un's statement indicated that North Korea will respond to Trump with its most aggressive missile test yet. That might include firing a Hwasong-14 intercontinental ballistic missile over Japan to a range of around 7,000 kilometers (4,349 miles) to display a capability to reach Hawaii or Alaska. The statement will further escalate the war of words between the adversaries as the North moves closer to perfecting a nuclear-tipped missile that could strike America. In recent months, the North has launched a pair of still-developmental ICBMs it said were capable of striking the continental United States and a pair of intermediate-range missiles that soared over Japanese territory. Earlier this month, North Korea conducted its sixth and most powerful nuclear test to date drawing stiffer U.N. sanctions. South Korea called Kim Jong Un's rebuke a "reckless provocation" that would deepen his country's international isolation and lead to its demise. South Korea's Unification Ministry spokesman Baik Tae-hyun told reporters Friday that North Korea must immediately stop such provocations and return to talks on nuclear disarmament. Mat Pennington reported from the United Nations. AP writers Kim Tong-hyung and Hyung-jin Kim contributed from Seoul.